I thought I’d share a very general investment idea that with further diligence, could develop into a decent opportunity. Given the recent decline in oil prices, I decided to look at closed-end funds (CEFs) that hold master limited partnerships (MLPs). Investopedia has a more in-depth description of closed-end funds vs open end funds but here is a very basic explanation. An open-end fund is a mutual fund. Mutual funds companies create shares of their fund when investors want to buy, and remove shares when investors want to sell. Because of this, the number of outstanding shares is always changing. The price of a mutual fund is calculated at the end of each trading day and is based on the value of the fund’s underlying assets. This is called the net asset value or NAV. All investors who purchase a mutual fund during the day will receive shares at the same calculated price (NAV). A closed-end fund (CEF) trades on a stock exchange and like a normal stock, there are only a limited number of shares available to the public. It is similar to a mutual fund in that it holds underlying positions and has a NAV, but differs in fact that the price investors pay for it can drift significantly from the NAV. Here is a very oversimplified example of how a transacting in these fund structures would work. Assume we have one mutual fund and one closed-end fund. Each fund only holds a position in one stock (stock ABC). ABC Mutual Fund currently has only one investor and the investor holds all 50 outstanding shares of the fund. Today, another investor decides he wants to purchase $1000 worth of the ABC Mutual Fund. At the end of the day, ABC mutual fund sees a new $1000 investment order and purchases 50 more shares of ABC stock at $20 per share for the fund. ABC stock ended the day at a price of $20 and based on that, ABC Mutual Fund has a NAV of $20. 50 shares of ABC Mutual Fund are given to the new investor and there are 100 shares of the mutual fund outstanding. The fund now has an additional investor and an additional 50 shares outstanding. ABC Closed-End Fund currently has only one investor and the investor holds all 50 outstanding shares. Unlike a mutual fund, a CEF cannot simply create more shares when somebody wants them (hence “closed”). In this scenario, if a new investor wanted to buy ABC Closed-End Fund, he would have to buy them from somebody who currently owns them. Assume that today, the person holding the 50 outstanding shares of ABC Closed End Fund really wants to sell his shares because he heard a rumor about ABC stock that he didn’t like. ABC stock is trading at $20, but he can’t find anybody to buy shares of ABC Closed-End Fund for $20. Instead of waiting to find a buyer at $20, he decides to offer his shares for $19. At $19 he finds another investor willing to buy his shares. There are now still only 50 shares outstanding, but the price at which they were acquired was was 5% lower than the value of their underlying assets. We can see that because shares of a closed-end fund are fixed and traded on a secondary market, the price of the fund often trades at a discount or premium to its NAV. It is with this understanding that one realizes how injecting fear into markets has the potential to cause significant price dislocations in these funds. 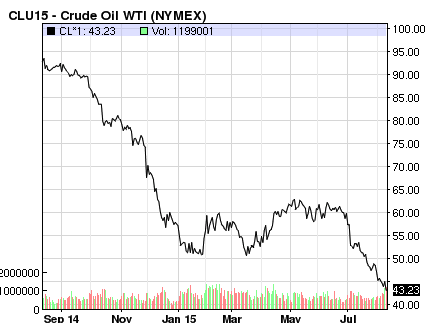 In the past year, the price of crude oil has been cut in half. Such a move in a relatively short period of time is sure strike fear into the market and it is not unreasonable to assume that emotions begin to drive many investor decisions. Emotions often cause irrational decisions and from that irrationality can stem great investment opportunities. Master Limited Partnerships (MLPs) are income generating investment vehicles that many energy companies use due to their advantageous tax structure (more on MLPs here). Given the oil rout, it is unsurprising that many CEFs invested in MLPs are currently trading at significant discounts to their NAV. Keep in mind, just because a closed-end fund trades at a discount doesn’t mean it will eventually go up in value. CEFs are known to trade at premiums or discounts over long periods of time for a variety of reasons ( distribution rate, leverage, stability of underlying holdings, management, etc.). When evaluating CEFs, one should look at the current premium/discount in relation to its historical norm. 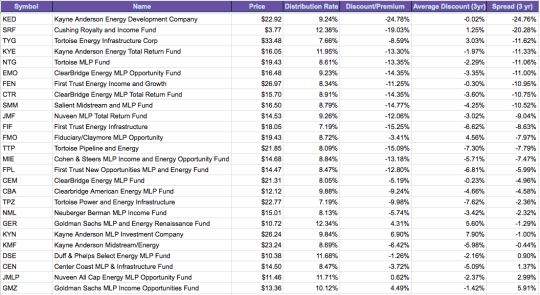 Below is a list of current CEFs that invest in MLPs and their current discount as it relates to the historic 3 year discount (spread). This list should by no means be interpreted as an investment recommendation, but instead an illustration of how one might begin to look for emotionally driven investment opportunities. For those interested in taking advantage of fearful markets and willing to put in the work, the CEF space is certainly worth some attention.